1. Char the peppers over a gas flame or under a hot broiler and then scrape off the blackened skin (do not wash). Remove and discard the seeds and stems and cut into large dice and set aside. Grill or roast the onion, serrano chile and tomatillos until lightly colored and chop coarsely. Remove core and seeds from tomatoes and cut into small dice. 2. Arrange half the sliced cheese in the bottom of 4 individual earthenware dishes and scatter all of the vegetables over the top. Sprinkle half the cilantro over this and season to taste with salt and pepper. Place remaining cheese over all and top with remaining cilantro. This can all be done up to a day ahead and refrigerated until ready to serve. 3. 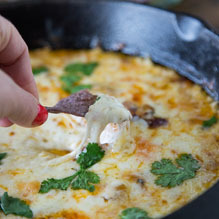 Place the filled dishes in a hot (425°F) oven for 6 to 8 minutes or until cheese is nicely melted and just beginning to color. Top with a tablespoon or two of the salsa and garnish with the avocado and cilantro sprigs. Serve immediately with crisp tortilla chips if desired.